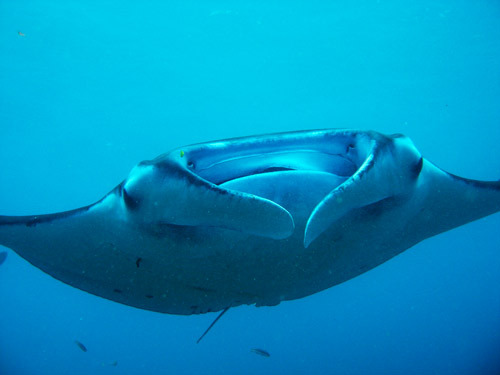 Hin Daeng Diving Paradise – A few hundred meters south of Hin Muang, you will find Hin Deang. Hin Deang is a pinnacle of limestone that breaks the surface by just a meter or two, depending on tides of course. This dive site rivals its neighbor, in fact there really is no separating either site, apart from the landscape differing slightly, both sites teem with life and both make for amazing diving. On one side there is an almost vertical wall with Gorgonian Sea Fans and soft red corals, as you swim mid water with the bottom sloping off into the deep, keep your eyes peeled for large pelagic fish that cruise these waters very frequently. Another special feature here is the huge boulders that form swim throughs. There is also a valley that splits from part of the main island; it’s worth exploring this area too. The shallow side is around 15 meters, and then on the other side, it drops down quite deep. Here you can find Red Tooth Trigger Fish and also Clown Trigger Fish favoring this area too. There is a mooring line which divers use to descend and ascend and usually there to greet them are the resident Bat Fish. These fascinating fish are very curios and seem to come very close to see especially if the diver rubs their fingers together. Venturing further around the reef, it is quite visible how quickly it drops of into depth of blue; regular depth surveillance is recommended. The large pelagic fish are a common sighting in this particular part and this great spot to observe them, as they swoop in and gobble up any plankton that is in the area. The whole rock is covered in absolutely stunning red soft corals, hence its name Hin Deang (Red Rock). The area attracts very small glass fish and bait fish, this attracts the more active Jacks and Trevally’s that come here to hunt and to terrorize the smaller fish. If it’s possible, find a nice quite area, buoyancy permitting, and observe the show. It is fantastic. Better than any wildlife TV program. There is a huge school of Pickhandle Barracuda, also lone-wolf Great Barracuda’s, as they go lurking and quietly follow the diver, curious as to what the bubble blower is doing. There is a huge variety of Moray Eels down there, including Honeycomb and Zebra morays, which are rarely seen elsewhere. Snake Eels have also been seen scuttling around the bottom. In fact the variety of macro life at Hin Daeng is unique to the area. Several species can only be found here. The Harlequin box shrimp are not always easy to see, it takes a shrewd diver to realize that any four legged starfish may have been recent victims to these little critters.